Royal Toybox: Of course, I can't wait for the strike party. It’s tech week, or for those of my friends who have also failed to entirely forget terms from their theatrical lexicon, it’s HELL WEEK. In an ideal world, the week leading up to a show is rarely about character development or finding artistic vision or scene study. It’s about getting the lights set up, or making sure the musical score is ready to go, or putting up signs for parking. This Saturday, the Fall Open House is here at the university, one of the two tasks I’ve been hired to help coordinate (the second is in the spring semester). So tech week for me translates to getting the room assignments set up or, or making sure the PowerPoints are ready to go, or… well… putting up signs for parking. It also means that since less important things like shaving are put on the back burner for a few days, I get to grow my beard back. 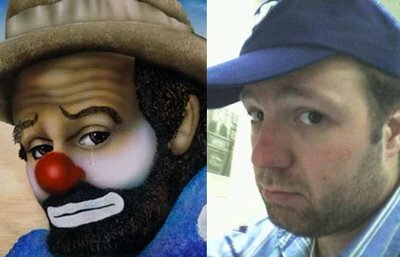 Unfortunately, I seem to have lost my once-champion-level facial hair growing skillz, because I currently look less like Russell Crowe and more like sad hobo clown. The reddish Ted Kennedy-esque nose doesn’t seem to help on that either. Well, at least people will know where to park. this is the greatest picture comparison in the universe.